Epic folk metallers Adavänt from Chandler, Arizona (USA) have successfully completed their crowdfunding campaign! They are preparing to enter the studio in July to record their 3rd full-length album titled “The Unyielding” and will be pushing for a release in the fall of 2017! For this release, Adavänt is determined to create something truly special for diehard fans and new listeners alike. Accordingly, the band took over a year hiatus from live performances to painstakingly craft the music and story of “The Unyielding“. Now completely written and musically honed to perfection, the band is proud to say that this album is undoubtedly their finest work yet. The exciting concept album follows the tale of an intrepid hunter who undertakes a journey to unravel a timeless mystery, set upon the backdrop of a fictional world created by Adavänt. After a failed assassination attempt upon his king, Darius the Unyielding is called upon to hunt down and destroy the culprit and dismantle the rebellious Brotherhood that has arisen throughout the kingdom. However, as he travels across the land and follows the clues to the assassin’s whereabouts, he discovers a horrifying truth that causes him to question his allegiances, and ultimately, his true identity. Artwork for the album will be provided by esteemed graphic artist, Tony Alongi. The album booklet will also include a full color map of the Kingdom of Dimiscia, allowing the listener to follow along with the characters as the tale progresses. 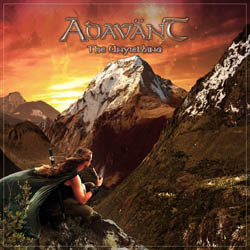 This will provide an immersive and epic experience, certain to transport the listener to the world of Adavänt’s lore. Each track on the album is named for a specific location in the Kingdom of Dimiscia where the action is occurring in the story. VITER published old demo songs!